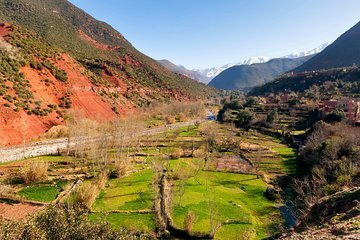 Escape del ajetreo y el bullicio de Marrakech y diríjase a las impresionantes montañas del Atlas, visitando los 4 valles que hacen famosa a la región: Ourika, Oukaimeden, Sidi Fares y los valles de Asni, descubra paisajes más cautivadores y continúe hasta el hermoso lago Takerkoust y el enorme Kik Plateau. ¡También experimentarás la cultura tradicional bereber en el camino! Después de la recogida en la mañana de su hotel en Marrakech, viaje con su grupo pequeño en un vehículo cómodo y con aire acondicionado, con un guía experimentado de habla inglesa a través de las majestuosas montañas del Atlas. Admire los imponentes picos nevados en su viaje de 1 hora hasta el primer valle Ourika, famoso por sus cascadas, las cascadas de este valle exuberante son un hermoso contrapunto al paisaje circundante y la visita guiada lo ayudará a explorar completamente estas cascadas con su experto guía de montaña, son aproximadamente 80 minutos de ida y vuelta a pie (si no te interesa esta caminata, puedes disfrutar de una bebida en uno de los cafés a orillas del río), disfrutarás de diferentes paisajes y obtendrás vistas espectaculares, en este valle tendrás la oportunidad de visitar a las mujeres bereberes que extraen el aceite de argán (el único aceite marroquí). Continúe por el segundo valle, que es el valle de Oukaimeden (Estación de esquí), y tome una carretera de montaña aislada a 1.800 metros sobre el nivel del mar para llegar al tercer valle de esta excursión, que es Sidi Fares, pasará por los pueblos tradicionales bereberes construidos en adobe. y piedras, y para descubrir la auténtica vida de los bereberes y la cultura, organizaremos un delicioso almuerzo incluido (ensalada o sopa marroquí, tagine bereber, cuscús marroquí, postre y bebidas) en una típica casa bereber. Después, diríjase hacia el cuarto valle que es Asni, famoso por sus árboles frutales (manzanas, nogales, almendras, melocotones ...), tenga su cámara lista para tomar fotografías del pico más alto del norte de África, el monte Toubkal con 13 665 pies . En este punto, vuelva a Marrakech o, si ha elegido la opción extendida, continúe su viaje por el campo marroquí durante una hora más. Viaje al lago Takerkoust, un sereno lago artificial de color azul zafiro, popular entre los lugareños, luego, pase los campos de trigo y los pueblos en su camino hacia la meseta Kik, un afloramiento de piedra caliza distintivo en las montañas del Atlas que ofrece maravillosas vistas de los exuberantes valles de abajo. Regrese a Marrakech y concluya su emocionante recorrido a través de las montañas del Atlas con la llegada a su hotel a las 5 pm aproximadamente. Our guide Adil arrived on time, very informative. We were the only family on the tour so felt like a personal service. Transport clean. The hike to the waterfall was fun. The Berber lunch excellent, even 2 members of my family that are fussy ate the lunch. Very scenic going through the valleys. Adil stopped at each valley for us to take photos. Nous avons passé la journée à 2 couples avec Abdel un super guide. Un guide très expérimenté avec de nombreuses explications et commentaires pertinents. Nous avons découvert avec lui la culture des habitants des montagnes les Amazirs (les berbères) et avons dégusté un délicieux déjeuner chez une famille berbere. En bref super journée et super guide un grand merci à ABDEL. We, 3 women, had a wonderful time. Chakib made an excellent guide. The pick up went smoothly and we really appreciated the fact that there were only 7 of us. If you like small personalised tours with a guide who is helpful but not intrusive this is for you. Chakib answered our questions carefully and explained details about the region. He was friendly and polite. We loved the valley scenery and the walk, guided by Jamal, was very special. It's a challenge but with Jamal's support those who wanted to made it to the waterfall. Amazing lunch, best we had in Morocco. Food catered for vegetarians and meat eaters. We're not usually keen on lunch with locals but we would thoroughly recommend this one. Lovely people in mountain setting. Give this tour, and Chakib top rating for everything. Can't recommend it enough. This was a challenging hike for my parents and at times for me but worth it as the waterfall is beautiful at the top of the mountain. The Berber meal was very tasty and well cooked. It was great to see and visit the village people. the only drawback is that is weather was cloudy at times and we didn't get the see to of the mountains or have a clear view when we reach high points. Also you only visit two valleys and drive past the other two. I think this should be advertised more accurately. Our driver and guide was very good and informative. Er worden veel trips aangeboden naar het Atlas gebergte. Deze is zeker niet de goedkoopste maar na lang wikken en wegen blij dat we deze gekozen hebben! Adil was een geweldige gids. Ervaren, rustig en ingormatief. Gelukkig geen kamelentour maar gewoon een pittige wandeling van 1,5 uur naar de waterval. Mooie fotostops van de valleien. We passeerden verschillende berberdorpjes en hadden een geweldige 3 gangen lunch, die gewoon bij de prijs inbegrepen zit. Het meer kregen we er gratis bij. We hebben echt het gevoel het atlas gebergte goed te hebben leren kennen. De stop bij de arganolie winkel was informatief en de dames waren niet opdringerig. Deze trip is echt een aanrader! There were only 2 other couples with us and our guide Jamal who was the highlight of the tour, very knowledgable, friendly and a good laugh. There is a fair amount of driving but it's well worth it for the variety of scenery. You go from windy roads through the lower mountains, where the locals live and trade, to snowy mountain peaks and everything in between including an oasis with sand dunes and palm trees. We were treated to a lovely 3 course lunch on the balcony of a families home halfway through the day and we ended up having a snowball fight with the kids of the village on our way back to the car! Probably one of our favourites of our trip to morocco, thank you very much Jamal! Abdel our driver and guide was one of the best we have had throughout the world. In the party of 6 there were 2 of us plus 2 French and 2 German. Abdel spoke excellent English and French and translated through out the trip. Highlight was lunch in local house in small Berber village with magnificent views over the Atlas Mountains. 3 course lunch with traditional Berber Tagenes was excellent. The visit will in morning to the river side village gave outstanding scenery, the hike in the foot hills was good but exhausting. 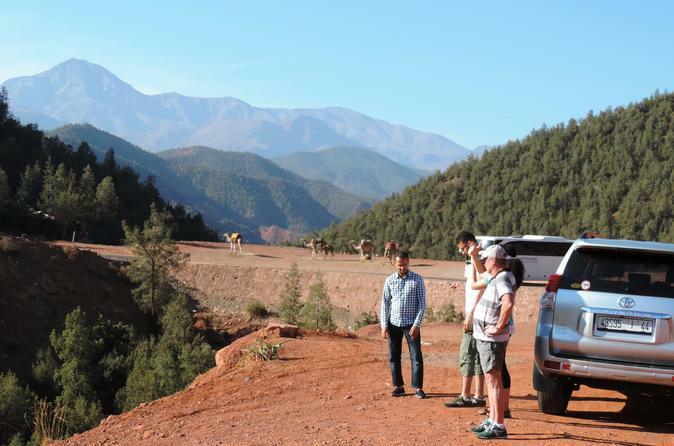 Enjoyed this full day tour of the beautiful Atlas mountains enormously. Abdel was very informative, we learnt a lot about Morroccon culture and the lunch in a Berber house was delicious. our tour guide abdel was fantastic,very accomodating and he was very attentive to us.we really enjoyed the tour and the views is gorgeous..we are really happy with the tour and highly recommend it.